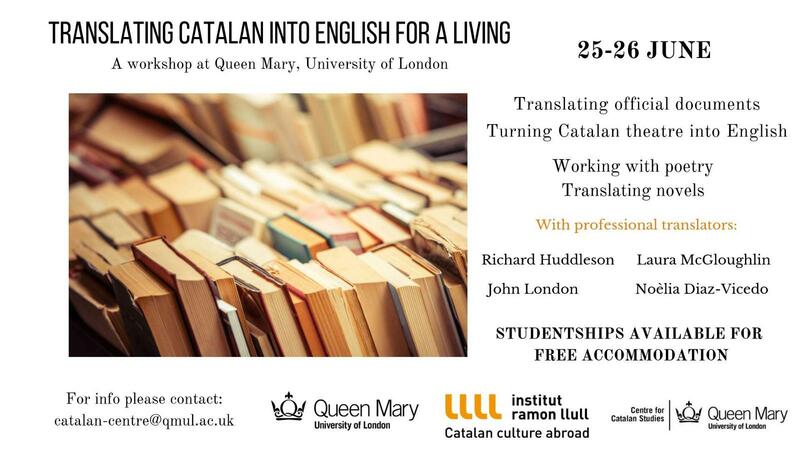 Studentships available to learn the secrets of translation (English-Catalan) at the workshop organised by the Centre for Catalan Studies at Queen Mary, University of London, to be held between the 25th and the 26th of June. Pre-registration deadline: 15th of April. Are you fluent in English and have at least an intermediate level (B1/B2) of Catalan? Are you considering a career in translation or want to improve your skills? You’ve come to the right place! – Richard Huddleson, official documents. Please note there are 8 studentships available to cover accommodation in London for 2 nights! You can pre-register via the event’s site. Pre-registration deadline: 15th of April. Please note a registration fee of £20 applies, although pre-registration does not require payment.